There has been increasing concern that the pollution of rivers is worsening despite the implementation of much publicised projects and other efforts of the government. Gopal Krishna, Delhi-based convenor of Water Watch Alliance, an international network on water related issues, speaks to Reshma Bharti about the wider changes that are needed to save our rivers from pollution. Why have the existing efforts failed to make any significant contribution to reduce pollution levels in India? Issues of water quality, water quantity and land use are interlinked because one cannot deal with them as if they are separate from the river basin but this is precisely what is being done since the inception of British rule. There is no alternative to genuine river basin approach. Some problems relating to weaknesses of our laws and the limitations of our sewage plants have already received some recognition. What is not so well-recognised is that the worsening pollution of rivers is built into the existing patterns of industrialisation (including increasingly industrialised agriculture) and urbanisation. So there has to be more broad-based policy changes or policy reversal before we can really succeed in reducing river pollution. Another critical factor is the balance of power between those who are responsible for causing pollution and the communities, particularly riverside communities who can make a real contribution to reducing river pollution. This balance of power is at present highly biased in favour of the former. The existing system favours polluters rather than those who want to resist and fight pollution. This has to change and the communities who are willing to be involved in monitoring and reducing pollution should be so strengthened that they feel empowered to resist pollution and polluters. Emphasis should be given to 'community monitoring of environmental health'. As rivers are considered sacred by many people, is mass mobilisation of people to reduce pollution possible? There have been a few examples here and there to show the potential of people's mobilisation on this issue. For example in Punjab Baba Balbir Singh Seechewal was able to mobilise people and save a sacred water source from pollution. Kali Bein, a 160 km sacred river which was reduced to a filthy drain by six towns and more than 40 villages through community efforts has now been cleaned. It is interesting that he challenged those who opposed him to show any law which gives polluters the permission to pollute water bodies! However the argument about sacred rivers should be broad-based. All rivers, water sources and the adjoining land mass are sacred. We can't concentrate on just one or two rivers like Ganga being called sacred. For people of various areas in a big and diverse country like India it is the rivers flowing in their region which are sacred to them. So our concern about mobilising people to protect rivers should extend to all rivers and all parts of the country. If someone enters our homes without our permission, it is considered criminal trespass. Industries are letting their pollutants enter our veins and arteries and cause health hazards, gene pool contamination and even deaths but with impunity. Political parties that get funded by industrialists extend mere impotent lip-sympathy to the emotions of people about sacred rivers, but shy away from the wider policy changes that are needed to protect rivers. State funding for political parties for fighting elections along with mobilization of communities alone can stop current ant-river basin practices that threatens our water quality, water availability and soil health. What are the wider policy changes that are needed to protect rivers? Briefly, saving our rivers has to be an integral component of policies, programs and projects on urban, industrial, water, land use, agricultural and energy. 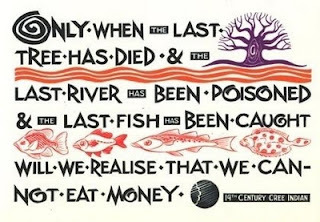 In the light of the adverse consequences ongoing amputation of rivers from its basin, there is a compelling logic for reversal of current policies based on natural resource accounting to ensure inter-generation equity. Only then we can ensure that the burden on rivers will not grow beyond their carrying capacity. We should no longer live under the illusion that pollution burden can grow to any levels but we'll somehow build the treatment plants to save our rivers. The complex of policies which decide how much water will remain in rivers, how many hazardous chemicals are being released, what will be the increase in sewage and industrial pollution are very important and all these issues have to be addressed through radical structural changes in the governance of our natural resources.